This article is about the magazine. For the flash RAM cartridge service for the Super Famicom and Game Boy, see Nintendo Power (cartridge). Nintendo Power is a video game news and strategy podcast from Nintendo of America, which had originated in August 1988 as Nintendo's official print magazine. The magazine's publication was initially done monthly by Nintendo of America, then independently, and in December 2007 contracted to Future US, the American subsidiary of British publisher Future. Its 24 year production run is one of the longest of all video game magazines in the United States and Canada. On August 21, 2012, Nintendo announced that it would not be renewing its licensing agreement with Future Publishing, and that Nintendo Power would cease publication in December. The final issue, volume 285, was released on December 11, 2012. On December 20, 2017, Nintendo Power officially returned as a podcast. 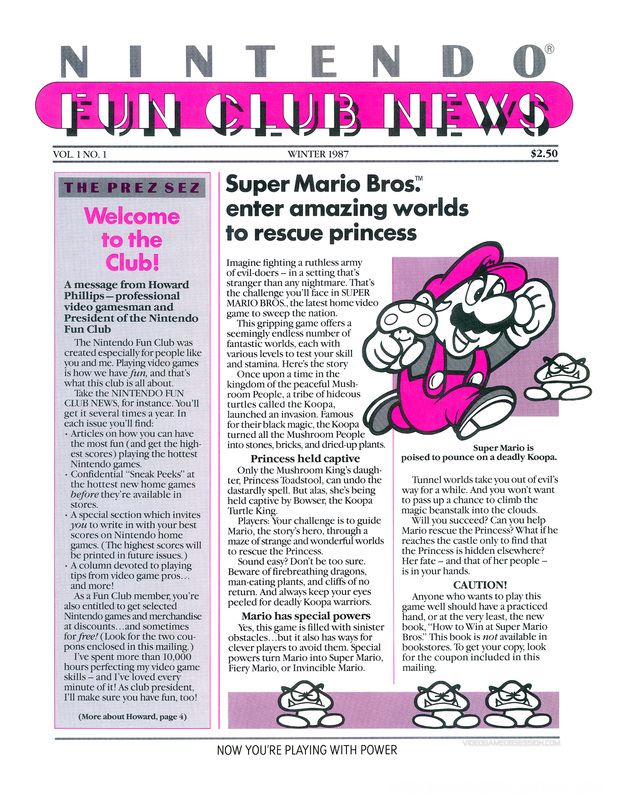 Predating Nintendo Power is the Nintendo Fun Club News, a newsletter sent to club members for free. In mid-1988 it was discontinued after seven issues in favor of Nintendo Power. The new magazine was founded by Nintendo of America marketing manager Gail Tilden in 1988. The first issue, dated July/August 1988, spotlights the NES game Super Mario Bros. 2. Of this issue, 3.6 million copies were published, with every member of the Nintendo Fun Club receiving a free copy. From the beginning, Nintendo Power focuses heavily on providing game strategy, reviews, and previews of upcoming games. In mid-1998, Nintendo Power first allowed outside advertising in the magazine, formerly reserved for Nintendo-based products only. In its early years, ads only appeared in the first and last few pages of the magazine, leaving no ads to break up the magazine's editorial content. As of July 2005, Nintendo Power has a new design to appeal to a limited gaming audience, including a new logo and article format. Along with the cosmetic overhaul came a greater focus on Nintendo fans, staff reviews, rumor-milling, and fan service including an expanded and enhanced reader mail segment (known as "Pulse") and a revamped "Community" section. Nintendo introduced a new incentive promotional offer that involved the registration of three Nintendo (or Nintendo affiliated) products through Nintendo.com to receive a free three issue trial subscription to Nintendo Power. Later, the magazine changed its focus from game strategies and cheat codes to mainly news, previews, and articles on upcoming games. On September 19, 2007, Nintendo officially announced that the large magazine publisher Future US would begin publishing Nintendo Power. The company's first official issue was released in October, as issue #222 (December 2007). It was also revealed that circulation would be increased to 13 issues a year, with the extra magazine being a holiday season bonus issue. Nintendo Power stopped making the Bonus issue in 2011. On August 21, 2012, Nintendo announced that it had opted not to renew the licensing agreement with Future Publishing and that Nintendo Power would cease publication after 24 years. The final issue would be December 2012. Senior Editor, Chris Hoffman stated that his staff would "try to make the last issues memorable". Nintendo reportedly did not actively participate in discussions to continue the magazine online. Nintendo Power officially returned on December 20, 2017 as a podcast, using the original logo design. The magazine was edited at first by Fun Club "President" Howard Phillips, himself an avid gamer. While the Fun Club News focused solely on games made in-house by Nintendo, Nintendo Power was created to allow for reviews of games produced by those licensed by Nintendo, such as Konami, Capcom, and the like. Nintendo Power's mascot in the late 1980s and early 1990s was Nester, a comic character created by Phillips. After Phillips left the company, Nester became the magazine's sole mascot. Early issues of the magazine featured a two-page Howard and Nester comic, which was later replaced with the two-page Nester's Adventures, later reduced to one page, and eventually dropped altogether. 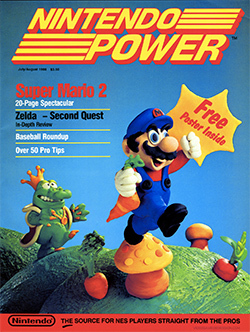 Subsequently, Mario replaced Nester as the mascot of the magazine. Later, during the early 2000s, the magazine made another mascot out of its Senior Writer, Alan Averill. Apparently very camera-shy, Averill himself never appeared in any photos; rather, he was represented by a plush toy of a Blue Slime from Dragon Quest. Fans often clamored to see what Averill actually looked like, but the magazine continued to substitute with photos of the toy, and even claimed that Alan was, in fact, a Blue Slime. Eventually, Averill retired from Nintendo Power, joining Nintendo of America's localization department. To this day, most fans have never seen a real image of Averill. The inclusion of a photo of Mr. T in the Player's Pulse section became a running gag in the early half of 2005. Late in the magazine's life, running gags centered on Chuck Norris references and jokes at the expense of writer Chris Shepperd. During the early 1990s, the magazine used what was a unique and very expensive promotion: giving away a free copy of the new NES game Dragon Quest to every new subscriber. This promotion was in part a move on Nintendo's part to make money off Dragon Warrior (Dragon Quest in Japan) which had not sold nearly as well as Nintendo had anticipated, and it was left with a large number of unsold cartridges on its hands. The promotion both helped the company get rid of the unsold merchandise, and won the magazine thousands of new subscribers. Following the release of the Super NES, the magazine featured lengthy, continuous comic stories based on Super Mario World and The Legend of Zelda: A Link to the Past. After these stories ended, they were replaced by similar multi-issue stories based on Star Fox, Super Metroid, and later on, Nintendo 64 games such as Star Wars: Shadows of the Empire and Blast Corps. Comics based on the animated series of Pokémon and Kirby: Right Back At Ya! also made several appearances. Toward the end, short excerpts based on Custom Robo and Metal Gear Solid are featured, as well as a very short Metroid Prime comic, and one based on the Pokémon Mystery Dungeon games translated from the original Japanese version. Nintendo Power produced a series of strategy magazines called Official Guides from Nintendo Power. The first one is simply called The Official Nintendo Player's Guide. Since Nintendo Power switched from a bi-monthly magazine to a monthly magazine in May 1990, every other issue is a strategy guide focused on a single game. Only four such strategy guides were released. Nintendo then outsourced production of official guides to Prima Games. During 2001, Nintendo Power released a spin-off semi-magazine named Nintendo Power Advance, featuring the Game Boy Advance and its games. A copy of the first issue was given complimentary to subscribers in addition to being sold at newsstands. Four issues of Nintendo Power Advance were printed, the last of which serves as a strategy guide for Super Mario World: Super Mario Advance 2. With the release of Pokémon for the Game Boy, Nintendo Power includes six mini-issues of Pokémon Power mainly featuring tips and strategies for the game. In 1989, a smaller version of the magazine called Pocket Power was distributed at movie theaters showing The Wizard. Nester is the long-time teenage mascot and comic strip star of Nintendo Power. Nester was created by Howard Phillips, "President" of the Nintendo Fun Club and a former editor of Nintendo Power, to be the supporting character in his comic strip, Howard & Nester. The comic strips generally advertised new games, often by dream sequences where Nester was actually a given video game character. From 1989 to 1993, The Nintendo Power Awards featured Nester-shaped trophies and were referred to in the magazine as the "Nesters" as a reference to the Oscars. In the June 1991 issue (Volume 25), Phillips was written out of the strip after his real-life counterpart left Nintendo to work for LucasArts. The strip was retitled Nester's Adventures the following issue and continued publication until Volume 55 (December 1993). Nester, now as a college student, appeared in Nintendo Power issue #100. He is seen again in issue #231, the magazine's twentieth anniversary, here a grown man with a son new to Nintendo. Nester's final appearance in Nintendo Power is in the final issue, Volume 285, in a comic titled "Nester & Max", where he is seen reading and lamenting the final issue. He is then reminded by his son that, "None of this is really going away, is it? I mean, Nintendo Power had a great run and you've got it all right here. It's like when you finish a great game - you're kind of sad to see it end, but really proud and happy, too. You know what I see when I look at this final issue? 100% completion." Nester had also been featured in a few video games that were released while the character was still featured in the magazine. His first appearance was as a commentator in NES Play Action Football. Other appearances include the ending of To the Earth. Nester was the main character in Nester's Funky Bowling for the Virtual Boy, which also introduced his sister Hester. The character of Lark in Pilotwings 64 for the Nintendo 64 was based on Nester. Several games for the NES featured the name "NESTER" as one of the pre-set names on high-score lists, or a default character name such as in To the Earth. The original NES release of Dragon Warrior references both Howard and Nester through character dialog, however this was removed in the later Game Boy Color version. He is mentioned in one line of dialogue in the game StarTropics. A DLC microgame in WarioWare D.I.Y. created by Nintendo Power called Funky Boxing (a loose reference to Nester's Funky Bowling) does not have any apparent references to the character, but if the game is opened in the editor, the player's boxer is named "NESTER." On December 20, 2017, Nintendo of America announced the official return of Nintendo Power in the form of a podcast, hosted by former Editor-in-Chief of the original magazine, Chris Slate. In the first episode, Slate states that the podcast was a "passion project" for Nintendo and that he wanted Nintendo Power to return. He also acknowledged that the format of that episode was experimental and that the frequency of the series' episodes hasn't been determined. Later in the episode, Slate interviews with the developers of The Legend of Zelda: Breath of the Wild and discusses the Nintendo Switch. Official Nintendo Magazine, the U.K. and Australian equivalent. Nintendo Magazine System (Australia), the former Australian equivalent. Nintendo Dream, the Japanese equivalent. Club Nintendo, the Mexico and Latin America equivalent. Nintendo World, the Brazil equivalent. Nintendo Force, a spiritual successor. ^ a b Kain, Erik (23 August 2012). "Nintendo Power Magazine Will Cease Publication This December According To Nintendo". Forbes. Retrieved 17 December 2014. ^ "Nintendo and Future US Team To Publish Nintendo Power magazine". Future US. 19 September 2007. Archived from the original on 2 November 2013. Retrieved 17 December 2014. ^ Mallory, Jordan. "Nintendo Power coming to an end". Joystiq. ^ John Gaines. "Where Have All the Magazines Gone?". Library Point. Retrieved March 14, 2016. ^ Phillips, Howard (1987). "Welcome to the Club". Nintendo Fan Club News. 1 (1). Retrieved 17 December 2014. ^ Phillips, Howard (July 1988). "Nintendo Fan Club News #7". Nintendo Fan Club News. 2. ^ Harris, Blake J. (2014). Console Wars: Sega, Nintendo, and the Battle That Defined a Generation. NY, NY: HarperCollins. pp. 56, 58. ISBN 978-0-06-227670-4. ^ "Future officially takes over Nintendo Power". Nintendo Forums. 12 October 2007. Retrieved 2014-05-21. ^ Jordan Mallory (August 21, 2012). "Nintendo Power coming to an end". Joystiq.com. Retrieved August 21, 2012. ^ Sarah LeBoeuf (August 21, 2012). "Nintendo Power Ceasing Publication After 24 Years". Escapistmagazine.com. Retrieved August 21, 2012. ^ "THE UNDERWHELMING FATE OF DRAGON WARRIOR". Press The Buttons. Retrieved 18 December 2014. ^ Parish, Jeremy (21 August 2013). "The New Dark Age of Dragon Quest". USgamer. Retrieved 20 December 2014. ^ Luke Plunkett. "Pocket Power Unearthed". Kotaku. Archived from the original on October 12, 2012. Retrieved 2009-03-29. ^ a b Caoili, Eric (June 29, 2008). "Promotional Consideration: Nester's return". Engadget. Retrieved December 22, 2017. ^ Webster, Andrew (December 24, 2012). "Link to the past: making Nintendo Power's final cover". The Verge. Retrieved December 22, 2017. ^ Nintendo Power: "His handle is Lark, but everyone in class knows this guy is Nester." Nintendo Power. Nintendo of America. September 1996, page 25. ^ "Mario Maze by WADY". ^ "Nintendo Power Returns As An Official Nintendo Podcast". My Nintendo News. December 21, 2017. Retrieved December 21, 2017. ^ McWhertor, Michael (December 21, 2017). "Nintendo Power returns as an official podcast from Nintendo". Polygon. Retrieved December 22, 2017. ^ Gach, Ethan (December 21, 2017). "Nintendo Power Comes Back In Podcast Form". Kotaku. Retrieved December 22, 2017.